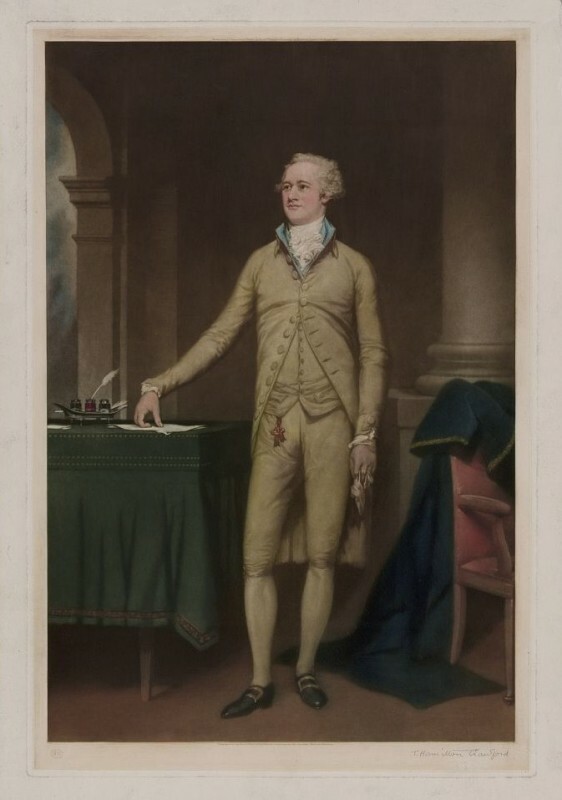 In 1791, Secretary of the Treasury Alexander Hamilton followed through on one of his long-standing ideas – the establishment of a national bank whose main purpose would be to collect taxes, hold government funds, and make loans to the government and other worthy borrowers. While it would be a private institution with a twenty-year charter from Congress, the Bank of the United States would indeed be more national than local in scope. It began operations in Philadelphia later that year. The building that once housed the First Bank of the United States still stands today at 120 South Third Street and is a unit of the National Park Service. The First Bank of the United States, erected in 1795-97, is a brilliant example of Federal architecture. Built in neo-classical design and ornately decorated with Corinthian columns and portico, this bank established the architectural style for any important building constructed in the newborn United States. The Federal style represented strength, dignity, and security embodied by the society and thus the architecture of ancient Greece. The blooming Republic was quite apprehensive to give the national government control of many things and banking was surely one of them. To gain public trust in a national bank, the First Bank of the United States was built in the Federal style and loaded with national symbols the new American Republic would recognize. Greco Roman design elements such as marble pillars and grand staircases were thought to recall the democracy and splendor of ancient Greece, and represented the harmony and equality thought to have existed there. Another symbol important to new nationalism and also evident on the First Bank of the United States is the Bald Eagle. Atop the two-story portico sits a carved bald eagle, which had been our national bird for only fourteen years at the time of construction. The Fidelity Trust Building (located on Broad Street between Walnut and Sansom) was placed on the National Register of Historic Places in 1978 as a result of its exceptional architectural elements and rich banking history. The French Beaux Arts style was made popular by American architects after the Chicago World’s Columbian Exhibition in 1893 and the Fidelity Trust, built in 1928, is considered to be one of the last and finest examples of this architectural style. Just one year before the Wall Street Crash in 1929 and in a decade fraught with business consolidation and skepticism, the Fidelity Trust opened its doors. At this time in history Americans sought out corporations they could be confident in. Bank buildings have a long history of conveying messages of trust through adornments and architecture, and the Fidelity Trust building is no exception. The Beaux Arts style represents a classical sense of sobriety and devotion to traditional values. To communicate that the Fidelity Trust was tied to a long history of financial stability in America, architects placed relief carvings of colonial coins above each smaller entrance. 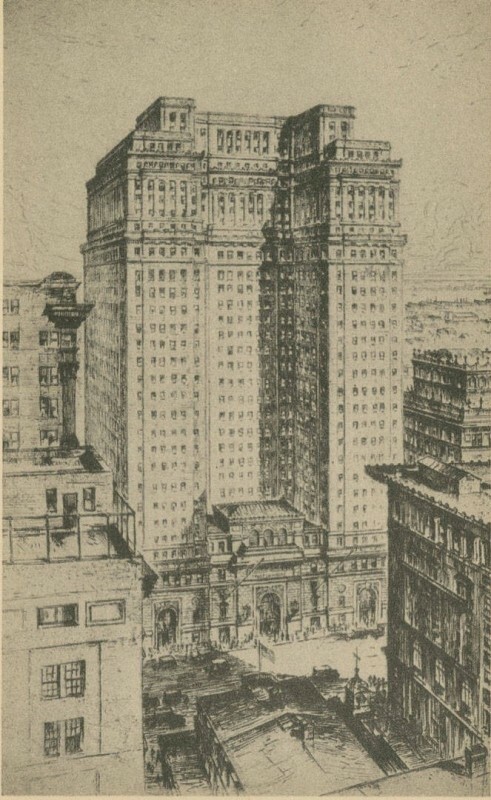 Though Fidelity Trust is now only part of Philadelphia’s historic memory, the architecture of finance still lives on. Near Walnut, on the southern arch, depictions of each face of the Franklin penn (the first coin issued by Congress in 1787) can be seen. Also, on Walnut, near the south façade, are representations of the Lafayette Medal, commemorating American independence. 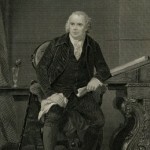 Robert Morris, appointed Superintendent of Finance by the Continental Congress in 1781, was considered to be one of the wealthiest and most successful businessmen in Philadelphia. Morris however, is famed for another reason; in 1798 he became one of the affluent and best-known American men to enter debtors prison. The Prune Street jail (now demolished but once located at the corner of present day Locust and Sixth streets) housed debtors as well as common criminals. Contrary to their criminal cellmates, basics such as food, water, or clothing were to be provided to the debtor by family only. The poorest of debtors often languished in jail and died of starvation or disease. However, Morris, being a man of means, spent much of his first few weeks stay at the Prune Street jail redecorating his cell and stocking it with comforts including "three writing desks, a borrowed mahogany table and desk, an ‘old Windsor Settee and eight old Windsor chairs,’ a copying press, dozens of letterbooks and account books, six chests and trunks of papers, drawers and letter cases for correspondence and business papers from 1777 forward, maps, mirrors, a trunk of clothes, and a bed." In fact, Morris outfitted his cell so nicely he even received President George Washington for dinner. 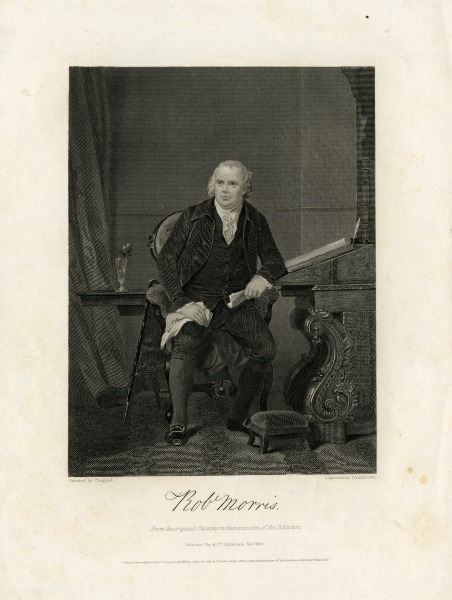 Morris was taken to jail after the panic of 1797 collapsed his land speculation schemes and left him with a sizeable debt even by today’s standards. He managed to avoid his creditors for nine months sequestered in his home, leaving one day a week on Sundays (the only day of the week a man could not be sent to prison). Men and women were often tossed into Prune Street by creditors who had hope their delinquent debtors would reveal some source of wealth that would pay their debts. With the American financial system still in infancy, a bankruptcy law did not exist. Often creditors hauled their debtor to jail in the hope that they plead insolvency or revealed some secret asset. Like his poorer comrades, Morris’ creditors hoped in vain he would declare insolvency and sell his assets. Robert Morris was released from the Prune Street jail in 1801 after the Bankruptcy Act of 1800 freed him of his financial obligations. In 1811 the United States did no extend its charter to the First Bank of The United States. Local merchant Stephen Girard purchased the building and established the Bank of Stephen Girard, the country’s first private bank. After his death in 1831 a group of local merchants hoped to take advantage of Girard’s sterling reputation and used his name for their own bank. 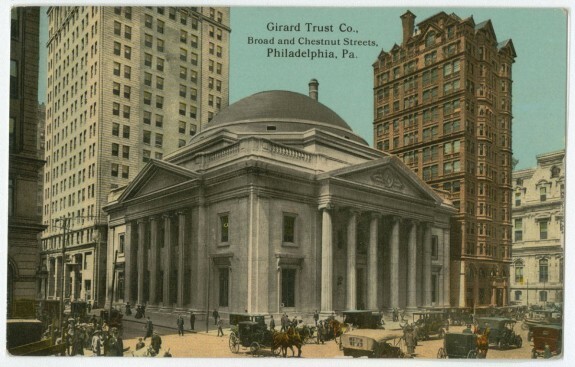 In 1952, Girard Trust Company acquired The Corn Exchange Bank's Philadelphia branch, and renamed itself to Girard Trust Corn Exchange bank. From 1964 to 1969, was known as Girard Trust Company, and it 1969, was renamed to Girard Bank. A group of businessmen established the Philadelphia Savings Fund Society to cater to the needs of small savers and depositors who were not served by commercial banks. The savers would also be owners of the ‘mutual’ savings bank served by Philadelphia’s commercial banks. 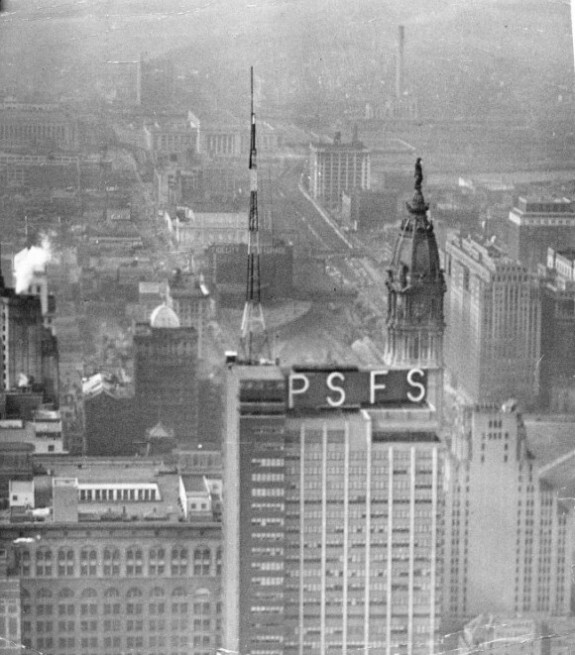 Though the iconic PFSF sign still lights the Center City skyline, the bank was merged out of existence in 1990. Greater Philadelphia’s banking roots go deeper than those of any region in the country. Philadelphia was the home of the first commercial bank (1782), the first national bank (1791), the first savings bank (1816), and the first savings and loan association (1831). Until the mid-1980s, celebrated local institutions such as First Pennsylvania, Girard, and Provident dominated the region. By the late twentieth century, however, historic regulatory changes led to acquisitions by out-of-town giants and changed the face of the banking industry both locally and nationally. The region’s prominence in banking began with the creation of the Bank of North America in 1781, when Philadelphia was the largest and most important city in North America. In February 1781, even as the War for Independence still raged, the Continental Congress appointed as its Superintendent of Finance Robert Morris, a partner in a successful mercantile house and one of the city’s best-known businessmen. 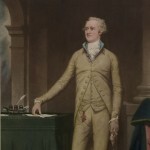 Shortly after, and building on both his ideas and those of the precocious Alexander Hamilton, Morris received congressional approval to establish the first commercial bank in the country. At first it was difficult to attract capital, but by early 1782, the Bank of North America was ready to open for business. The BNA loaned money to the federal and state governments as well as to many of the city’s businesses, thereby facilitating commerce among the colonies and between the United States and other countries. Soon after ratification of the Constitution of the United States in summer 1788, commercial banks sprouted in more than a dozen other cities. The Bank of Pennsylvania (1793) was the second founded in Philadelphia, and the Delaware legislature chartered the Wilmington-based Bank of Delaware in 1795. Meanwhile, in 1791, Secretary of the Treasury Hamilton followed through on one of his long-standing ideas – a national bank whose main purposes would be to collect taxes, hold government funds, and make loans to the government and other worthy borrowers. While it would be a private institution with a twenty-year charter from Congress, the Bank of the United States would be more national than local in scope. Four years after its founding, it moved to Third and Chestnut Streets, where a new Greek revival building with a Roman portico and Corinthian columns suggested solidity and stability. The first decade of the nineteenth century saw the establishment of several more banks in Philadelphia. Adding to the earlier institutions that largely served the needs of governments, upper class merchants, lawyers, and influential businessmen, the Philadelphia Bank (1803), Farmers and Mechanics Bank (1809), Commercial Bank (1810), and Mechanics Bank (1810) were formed by and for artisans, farmers, mechanics, and manufacturers. In 1810, the leaders of the District of Northern Liberties, just north of Vine Street but not served by the Philadelphia banks, formed the Bank of Northern Liberties. Another innovation occurred in 1816 when a group of businessmen, inspired by the success of savings institutions in England and Scotland, established the Philadelphia Savings Fund Society to cater to small depositors not targeted by commercial banks. The depositors owned this “mutual” savings bank, and shared in its profits. 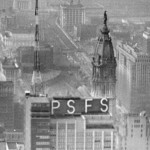 Long after the bank’s demise, the iconic PSFS sign atop the re-purposed skyscraper at 1200 Market Street continued to light the Center City sky. In the first decades of the nineteenth century, citizens in Delaware and New Jersey also established banks for their own use. In 1807, Delaware authorized the Farmers Bank of the State of Delaware and established its headquarters in Georgetown, enabling it to serve the farming communities in the state’s southern townships. During the following ten years, the state authorized three more banks in Wilmington. New Jersey established its first banks in Newark and Trenton in 1804. In 1812, it chartered six more banks, including the State Bank at Camden, the first in the southern portion of the state. 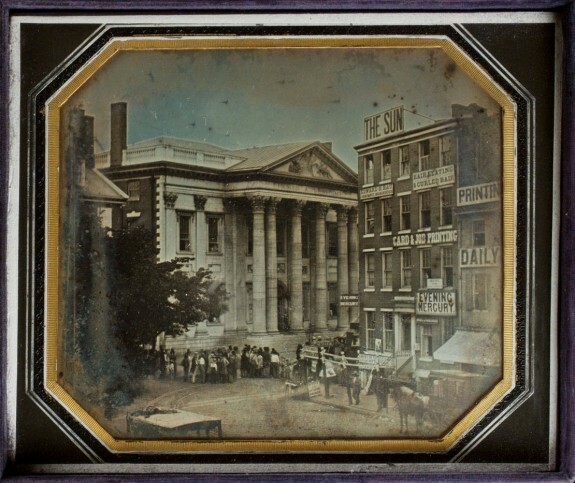 Although Philadelphia was no longer the nation’s capital after 1800, the presence of the Bank of the United States kept the city at the center of controversies about the nation’s finances. In 1811, anti-banking forces in Congress refused to extend its charter. Republicans believed the bank was unconstitutional, and that it benefitted only the moneyed class at the expense of all others. Local merchant and trader Stephen Girard acquired its building and fixed assets, and used his own capital to establish the Bank of Stephen Girard as the country’s first private bank, a bank with no publicly traded shares and no mandated service to customers. Philadelphia became home to a national bank once again in 1816, following the wreckage to the economy caused by the War of 1812 (1812-15) with Great Britain. Congress realized the need for another national bank to help regulate the supply of credit and expedite the financial dealings of the federal government. Philadelphia was still a leading financial center, so it was no surprise when Congress decided to headquarter the Second National Bank of the United States among the other banks on Chestnut Street. 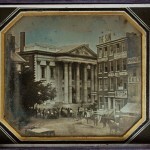 The bank operated out of Carpenters’ Hall for five years, and then opened in 1824 in its new Greek Revival structure modeled on the Parthenon, a symbol of strength and permanence. Banking in Pennsylvania expanded after the Commonwealth’s Omnibus Banking Act of 1814 divided the state into twenty-seven banking districts and approved charters for forty-one banks. Banking was a profitable business; businessmen across the Commonwealth urged the legislature to authorize the formation of more institutions. Citizens quickly organized banks in Bristol, Chester, Germantown, Norristown, and West Chester. The law imposed several new financial requirements on the institutions. One robbed the banks’ managers of the ability to make loans in any amount, to any worthy borrower, in any location. That restriction failed to recognize the law of supply and demand for credit. Many new banks freely supplied more credit than was demanded by worthy borrowers, and maintaining that excess supply of money was not sustainable. Within a few years, more than 40 percent of the new banks in Pennsylvania failed. Philadelphia’s long-established banks survived, and they became important cogs in the state’s attempts to battle New York and Baltimore for commercial supremacy during the next two decades. As early as the 1760s, some of the city’s political leaders understood the need to augment Philadelphia’s strong position in overseas commerce with expanded business ties with inland areas to the north and west. In particular, they believed the city needed to build stronger transportation connections with central Pennsylvania and its fertile Susquehanna Valley. State officials finally embarked on a crash program to create those much-needed commercial corridors. Throughout the 1830s, banks seeking the mandated renewals of their charters were compelled by law to loan the state the funds to execute that program. Although the state got its canals and turnpikes, most were unprofitable because they could not prevent lucrative commercial traffic from using other transportation corridors to the ports of New York and Baltimore. Pennsylvania’s revenue decreased even as its debt level ballooned. Bank creditors forced to finance those construction projects throughout the 1820s and 1830s suffered financially when the state suspended interest payments on its debt in 1841 and then demanded that the banks extend even more loans. 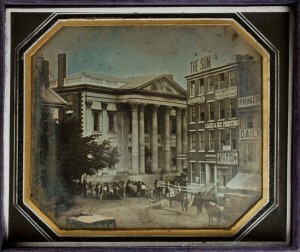 In Philadelphia, meanwhile, the Second Bank of the United States became the flashpoint for the national political conflict known as the “Bank War.” Soon after his election as President in 1828, Andrew Jackson made clear his displeasure with banks in general and the Second Bank of the United States in particular. In his view a large central bank, controlled and operated by the moneyed class, limited the growth of the hundreds of state banks that had sprouted in the previous quarter century. During the closing months of 1831, and in anticipation of the election of 1832, President Jackson tempered his arguments against the Bank. However, Bank President Nicholas Biddle was emboldened by the December 1831 recommendation for re-chartering the Bank by the Secretary of the Treasury. Spurred on by leading Philadelphia businessmen Biddle unwisely sought to forcefully blunt Jackson’s campaign against his institution by applying for a new charter in 1832, some four years before its first charter expired. Congress passed this re-charter bill, but was unable to override Jackson’s veto. The re-elected President then emasculated the bank by first transferring government funds to other banks, then convincing his allies in Congress to refuse another re-chartering effort. As the bank wound down its affairs, the contraction of loans, discounts, exchanges, and deposits led to severe economic dislocations before the bank closed its doors in 1836. Following that closing, and searching for still more funds to finance internal improvements, the Commonwealth of Pennsylvania immediately granted a state charter to a successor bank that promised both to loan the state additional sums and to pay a bonus for the privilege of operating. Working under such onerous restrictions, the new United States Bank of Pennsylvania failed only five years later – and took six other Philadelphia banks with it. Philadelphia’s banks suffered proportionately in the financial panics that gripped the nation in 1837 and 1857. Yet, throughout the period, entrepreneurs continued to establish new banks. Most of the action occurred in outlying districts of the city such as Kensington, Moyamensing, Southwark, and Spring Garden. Before and after the Civil War, political lending became less important as most of the city’s institutions sought to finance a growing number of railroads and manufacturers. After the Panic of 1873, many mergers among the surviving banks enabled those institutions to serve the needs of local and national firms during the manufacturing boom of the industrial revolution. 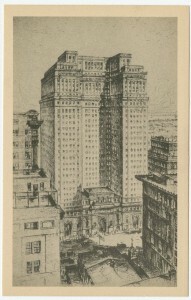 A handful of these acquisitive institutions evolved into such stalwarts of the twentieth century as Fidelity, Girard, and Provident, joining the successors of the Philadelphia Bank (Philadelphia National) and the Bank of North America (the Pennsylvania Company, later First Pennsylvania) as market leaders. After the turn of the twentieth century, many of the region’s banks further expanded their business with a nationwide clientele. 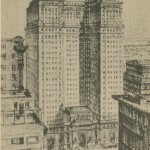 Their appetite for acquisitions remained strong; as a result of merger activity, the number of banks in Philadelphia declined from 1900 to 1914. During the years immediately after World War I, the banking franchise broadened to involve more businesses and citizens than ever. Corporations (such as Gimbel Brothers), unions (such as the Brotherhood of Locomotive Engineers), and the community leaders of various minority, ethnic, and religious groups established commercial banks, mutual savings banks, and trust companies throughout the region. The largest commercial banks continued their merger and acquisition sprees, and they supplied the capital that funded the growth of utility and industrial companies. The Great Depression devastated the banking community, particularly in the working-class neighborhoods. One-third of Philadelphia’s banks failed, including such high-profile institutions as Bankers Trust, with more than 100,000 depositors. Institutions in North and South Philadelphia, areas with high percentages of immigrant and working-class customers, collectively lost as much as 45 percent of their deposits. The losses were closer to 15 percent for banks doing business in the Northwest sections of the city or the central business district. One prominent survivor was the Citizens and Southern Bank at Nineteenth and South Streets, founded in 1921 by the civil rights advocate and entrepreneur Richard R. (“Major”) Wright Sr. as the only African American-owned bank in the North. Indeed, his conservative lending policies helped the bank become one of the first in the nation to open after President Franklin D. Roosevelt’s 1933 bank holiday. (His successors sold the bank in 1957.) Market leaders such as Fidelity, Girard, and Provident also survived the Depression but made few acquisitions throughout the period. The result was the emergence of a smaller but more stable banking community by the 1940s. Philadelphia’s banks prospered along with the city in the first two decades after the end of World War II. 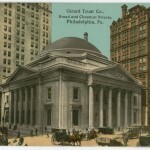 Competition among the institutions that served Philadelphia and its contiguous counties was constrained; branch banking had long been severely limited, and interstate banking was prohibited. But in the 1970s, firms such as American Express, General Motors, Merrill Lynch, and Sears Roebuck began offering loan and deposit services that made such longstanding banking restrictions less relevant. Regulations governing the banking business were seriously eroded by new technologies and new entrants to the marketplace. Competition became even more intense during the early 1980s, when Pennsylvania, New Jersey, and Delaware joined other states in allowing statewide branching and then intra-state mergers. In 1994, Congress passed the Riegle Neal Act, removing all restrictions on inter-state banking. Finally, in 1999 President William Clinton signed the Gramm-Leach-Bliley Act; it removed all remaining barriers between commercial banks, savings banks, investment banks, and other types of lending and depository institutions, thus remaking the landscape of the financial services industry. Among the dozens of institutions providing banking services to consumers and businesses in Greater Philadelphia, by 2010 only WSFS Bank in Wilmington could trace its founding as far back as 1832, when it was established as the Wilmington Savings Fund Society. Philadelphia’s Beneficial Bank, formed as a mutual savings bank, was established in 1853; and two other institutions headquartered in Philadelphia’s suburbs had legacies dating to the 1870s (Univest and National Penn Bancshares). Some newer organizations (including United Bank of Philadelphia and NOVA Bank ) were reminiscent of the limited-audience banks of the 1920s. However, the number of branch offices and the amount of deposits had become highly concentrated among national and international nameplates. Look carefully beyond those signs on the city’s old banking headquarters buildings, and you just might find the traces of their original tenants and the history of banking in Philadelphia. Michael A. Martorelli is a Director at the investment banking firm Fairmount Partners in West Conshohocken, and a frequent contributor to Financial History magazine. Bodenhorn, Howard. State Banking in America: A New Economic History. New York: Oxford University Press, 2002. Daniels, Belden L. Pennsylvania, Birthplace of Banking in America. Harrisburg: Pennsylvania Bankers’ Association, 1976. Holdsworth, John Thom. Financing An Empire: History of Banking in Pennsylvania. Philadelphia: The S.J. Clarke Publishing Company, 1928. Vitiello, Domenic and George E. Thomas. The Philadelphia Stock Exchange and the City it Made. Philadelphia: University of Pennsylvania Press, 2010. Wainwright, Nicholas B. The Philadelphia National Bank: A Century and a Half of Philadelphia Banking, 1803-1953. Philadelphia: The Philadelphia National Bank, 1953. Weigley, Russell F., ed. Philadelphia: A 300-Year History. New York: W.W. Norton, 1982. Wright, Robert E. The First Wall Street: Chestnut Street, Philadelphia and the Birth of American Finance. Chicago: The University of Chicago Press, 2005. Delaware Historical Society, 505 N. Market Street, Wilmington, Del. Federal Reserve Bank of Philadelphia, 10 Independence Mall, Philadelphia. Hagley Museum and Library, 200 Hagley Road, Wilmington, Del. New Jersey Historical Society, 52 Park Place, Newark, N.J.
Second Bank of the United States, Chestnut Street between Fourth and Fifth Streets, Philadelphia. Thanks, Michael, banking is such an important part of Philadelphia history and you did a great job of telling the story. Do you know exactly where the First Bank was located before it moved to 3rd Street in 1795? The only reference I found puts it somewhere on Chestnut, near 4th Street, which would place near the Bank of North America. Both the First Bank and Second Bank of the United States operated out of Carpenters’ Hall at 320 Chestnut Street until their own buildings were constructed.